Greece’s religious monuments: The wealth of its Byzantine monuments makes Greece the perfect destination for thousands of Christian pilgrims. Monuments of centuries-old ecclesiastic architecture and art, innumerable churches and monasteries give testimony to the country's rich religious heritage. Day 1. Arrival. Reception at the airport. Transportation to the hotel. Presentation of the program. Dinner at local restaurant with variety of traditional Cretan delicacies. Accommodation Heraklion. Day 2. WEST CRETE. REGION of CHANIA. 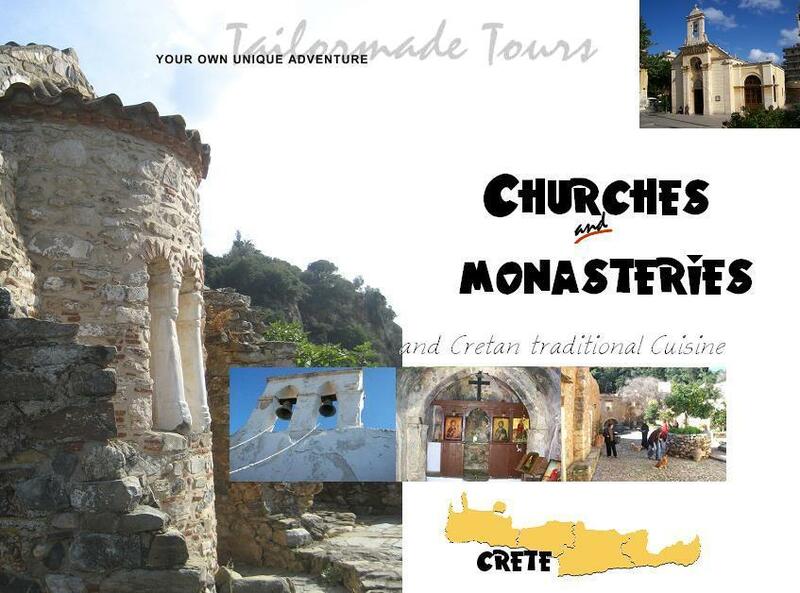 Region of Chania hosts several of most interesting monasteries . Today we visit the monasteries of KATHOLIKO, GOUVERNETO and AGIA TRIADA.Lunch at a local restaurant. Accommodation Chania and dinner at the old city of Chania. Day 4. WEST CRETE: REGION of RETHYMNON: Southern part still Chania region the ST. JOHN MONASTERY closed to the CHORA SFAKION and then the monastery of PREVELI. North direction Rethymnon and the village of PATSOS. In the entrance of a canyon there is the SAINT ANTONIOS small very old church in a small cave. Drive north direction Rethymnon where we accommodate. Day 5. WEST – CENTRAL CRETE: The monastery of ARKADI. Then the monastery of VOSSAKOS. Lunch at the mountain village of DROSSIA and the monastery of HALEPA. Break for a coffee with monk NIKOLAOS and join LIVE Cretan Lyra music by a famous local Lyra player and singer. Drive east to Heraklion where we accommodate. Day 6. CENTRAL CRETE: PREFECTURE OF HERAKLION: The monasteries of VRONDISSI at ZAROS area where we lunch and the monastery ODIGITRIAS at the southern part of HERAKLION region. Back to Heraklion where we accommodate. Day 8. EAST CRETE: SITIA REGION: Our first stop will be at the village of KAVOUSSI where stands the oldest ancient olive tree worldwide. The leaves of this tree used for the athletes on 2004 OLYMPIC GAMES. Continue and visit one of the most famous monasteries in Crete the TOPLOU Monastery well known out of its history through the years for the now ORGANIC products as olive oil, wine and honey. South again direction Ierapetra and break for lunch at the small village of Sikia where we taste fresh home made delicacies. Our next stop the village of LITHINES. In Lithines is the church of VIRGIN MARY with impressive wall paintings from 14thcentury. Accommodation at the near area. Day 9. EAST CRETE: IERAPETRA REGION: The KAPSAS monastery. Magnificent, Beautiful, Peaceful is what someone can say. Cultural tour of the area rest of the day and back to Heraklion where we accommodate. George Portokalakis 1 Ιανουαρίου 2015 - 11:01 μ.μ.